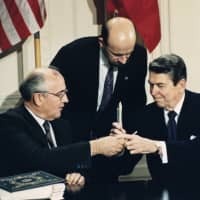 U.S. President Donald Trump has pinned much of the blame for Washington’s planned exit from the Intermediate-Range Nuclear Forces Treaty (INF) on Russian violations of the landmark pact. 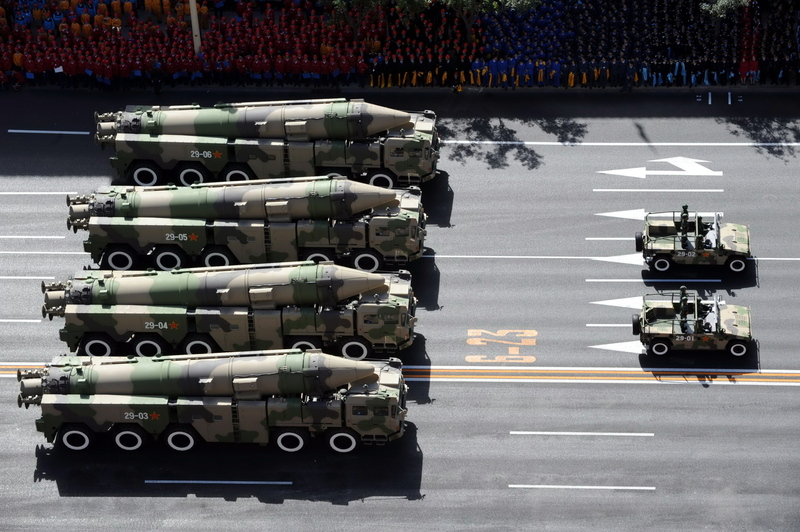 But a closer look shows that China’s buildup of its missile forces — which pose a grave threat to U.S. military bases in Japan and elsewhere in the region — may also play a large part in any decision to abrogate the 31-year-old arms-control deal. Trump on Sunday said the U.S. would scrap the 1987 treaty between Washington and Moscow, which bans all land-based missiles with ranges of 500 to 5,500 km (310 to 3,420 miles). The pact covers missiles, known as short- and intermediate-range, that can carry both nuclear and conventional warheads, but does not ban air- or sea-launched weapons. 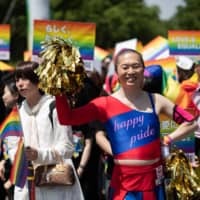 The historic bilateral pact, however, has left China unconstrained to amass a missile arsenal that puts U.S. and Japanese forces at risk, according to observers. At a Senate Armed Services Committee hearing in April last year, then-U.S. Pacific Command chief Adm. Harry Harris addressed the treaty and his views on its utility amid the tense security environment. 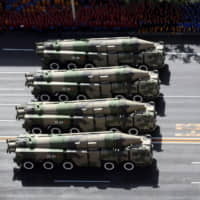 According to the Pentagon’s annual report this year on Chinese military power, Beijing’s robust military modernization program has allowed it to now field an array of conventionally armed short- and medium-range ballistic missiles as well as ground- and air-launched land-attack cruise missiles as part of its so-called anti-access/area-denial (A2/AD) strategy to prevent the U.S. and others militaries from intervening in its immediate areas of concern. More importantly for Tokyo, “a growing number” of the Chinese missiles put U.S. bases in Japan in range, the Pentagon report said. Indeed, according to PACOM’s Harris, approximately 95 percent of the missiles in the People’s Liberation Army Rocket Force arsenal fall in the 500 to 5,500-km range, Harris told a House Armed Services Committee hearing in February — meaning key U.S. facilities throughout Japan could already be within range of thousands of difficult-to-defeat advanced ballistic and cruise missiles. Some regional security experts have even speculated that the Chinese military may be practicing for pre-emptive missile strikes on the forward bases that underpin U.S. military power in the Western Pacific. Last year, U.S. naval officer Cmdr. Thomas Shugart, then a senior military fellow at the Center for a New American Security think tank in Washington, unearthed commercial satellite imagery that appeared to show sites in China’s Gobi Desert for practicing these strikes that resembled mock-ups of important American military facilities in Japan such as the naval base in Yokosuka, Kanagawa Prefecture, and the air bases in Kadena, Okinawa Prefecture and Misawa, Aomori Prefecture. 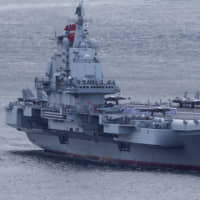 Amid this backdrop, and as the U.S. and China begin to enter what some have termed “a new Cold War,” the INF decision is likely to have a number of implications for Japan, including the possibility of the United States rebuilding its short- and intermediate-range missile arsenal and dispatching the weapons to the region. “Assuming there is no renegotiation or compromise with Russia, a pullout from Washington would remove a number of constraints on the conventional weapons that it can deploy in the East Asian theater,” said Miller. While this could increase options to enhance regional deterrence and confidence in the U.S.-Japan alliance, which has taken something of a beating under the mercurial Trump, it’s unclear if such a deployment would be politically viable, analysts say. Okinawa, which hosts the bulk of the U.S. military presence in Japan, has long been home to a fierce anti-base protest movement. Any decision to send the weapons there would likely face intense opposition. It would also put Sino-Japanese ties in danger as Prime Minister Shinzo Abe continues his outreach to Beijing amid the U.S.-China trade war. Also questionable is the necessity of sending such weapons to Japan or elsewhere in the region when ship- and air-launched missiles that don’t fall under the INF are already deployed across the Asia-Pacific. Those missiles, some have argued, are almost assuredly already seen as potential targets by Beijing. Still, others have said that leaving the INF could hand Tokyo just the opportunity it is hunting for as it looks to improve defense ties and boost exports of homegrown military equipment. Tokyo is already known for building world-class submarines. But so far, there’s been little success on the weapons export front, including several high-profile bid failures. Matthew Kroenig, a professor at Georgetown University, echoed this sentiment. 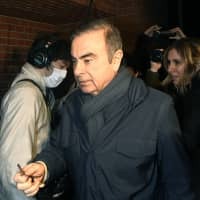 In the event this is not politically palatable in Tokyo or Washington, one alternative to a more permanent basing would be to deploy the weapons only in the event of a crisis. Eric Sayers, who served as a consultant to former PACOM chief Harris and is now with the Center for a New American Security, said he did not see the U.S. procuring the weapons and moving them to Japan “anytime soon.” Instead, this capability could be based in the U.S. “and then moved forward on a C-17 or afloat during a crisis or at a time when the alliance determined it would be of value,” he said. 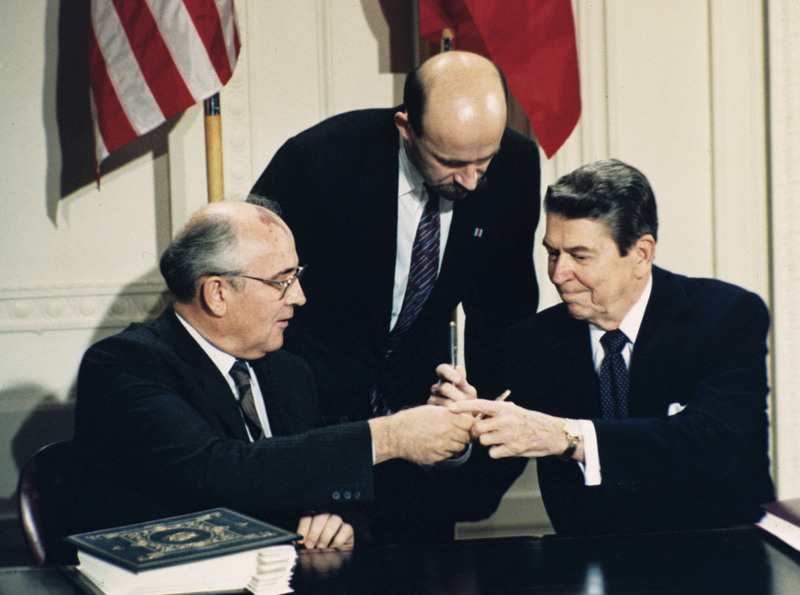 As for the prospect of an INF pullout leading to a full-fledged arms race akin to the one that was occurring when the treaty was initially signed in the 1980s, experts were split. “It is still premature to assume that an arms race will result, but the reality is that — even without the INF decision — tensions have been building between Washington and its relations with both Beijing and Moscow,” said Miller. But Trump himself has boasted of America military might, and the U.S. has already commenced research and development into conventional, ground-launched, intermediate-range missile systems, according to the 2018 Nuclear Posture Review, which the Pentagon published in February.